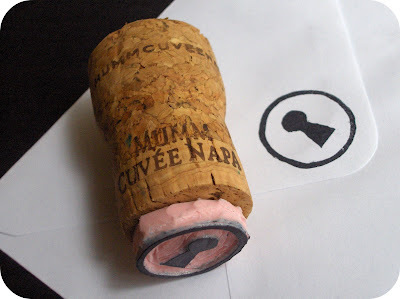 When I make smaller stamps, I like to use wine or champagne corks for the handles. After I carve out the stamp, I just glue it to the wine cork with a little E6000 glue. 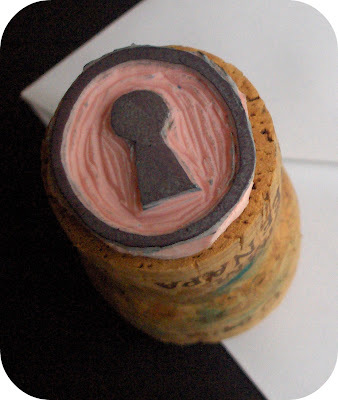 The wine and champagne corks add a little extra charm to the rubber stamps. If you've never made a rubber stamp before, Geninne's Art Blog has a well detailed tutorial. This is a great idea. And your stamp is really cute! Awesome! This would've been great for my wine themed swap on Craftster! I have tons of wine cork waiting to be carved...aaaah I wish I have the time..
Great idea! I like the fact that it is nice and light too. Super-smart idea! I can't wait to try it. great idea for mounting this kind of stamp! Another great wine cork idea that I am going to have to try! This is so, SO genius. It totally puts my bent paperclip handles to shame, lol. LOVE IT! I'll be linking. Another amazing idea, you are so talented! Great idea. I usually use children's building blocks from the thrift shop to mount my homemade stamps, but your way is so much more elegant! It's actually cute making that stamp and the cork as holder. I like the building block idea. I'll have to try that. This idea is great, cheap and super easy to make! Wow, thanks a million! My mind is going wild now.